But it’s important to remember that even through diplomatic lulls, the relationship continues to function. For one, TNI-AU and RAAF began their biennial exercise Elang AusIndo in Darwin today. The bilateral exercise focuses on airborne interception and involves eight Australian FA-18s, six Indonesian F-16s and 200 personnel from both sides. For images of past iterations of Elang AusIndo, check out Defence’s image gallery here (2009) and here (2011) or The Base Leg blog (2011). This is facilitated by the democratic values that the US upholds and Indonesia shares, which allow administrations to change from one extreme to another (for better or worse). In contrast, it’s unlikely that a leadership change in China could bring about a similar change of mood in Indonesia. Also, another ASPI-related link, my colleague Ben Schreer published a paper on Indonesia’s military modernisation. 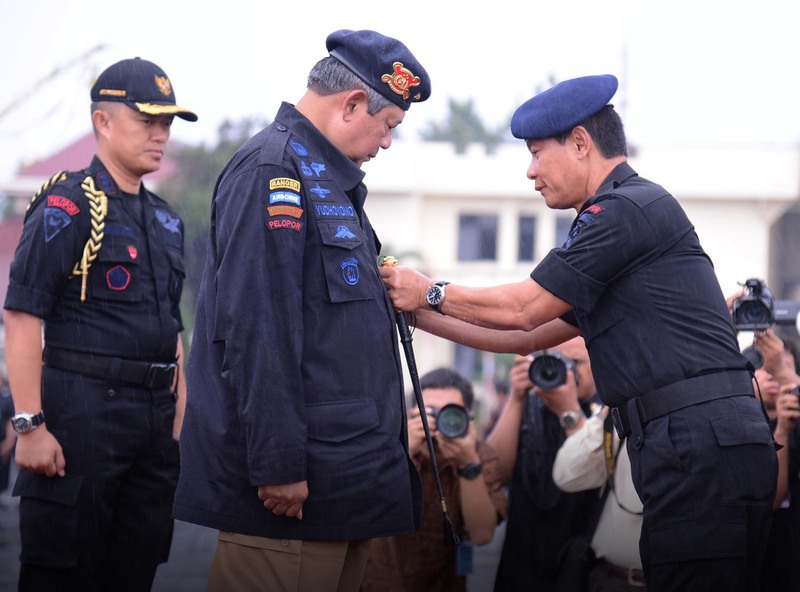 On a more whimsical note, last Friday President SBY was made an honorary member of Indonesia’s elite police, BRIMOB (pictured above). In his acceptance speech, he praised the professionalism of their corps as well as their service as part of a peacekeeping force in Darfur, Sudan. In other defence-related news, four female US Marines are about to graduate from enlisted infantry training this week. China is learning what U.S. military leaders have known for some time, which is that disaster relief and humanitarian aid are among of the most effective tools in the national security toolbox. It’s also central to the Pentagon’s post-war rebalance to the Asia-Pacific. Lastly, the 2014 Thawley Scholarship in International Security is a great opportunity for emerging Australian security wonks to undertake research at both the Lowy Institute in Sydney and the Center for Strategic and International Studies in Washington. Applications are now open and close Wednesday, 5 December. Image source: President of Republic of Indonesia.